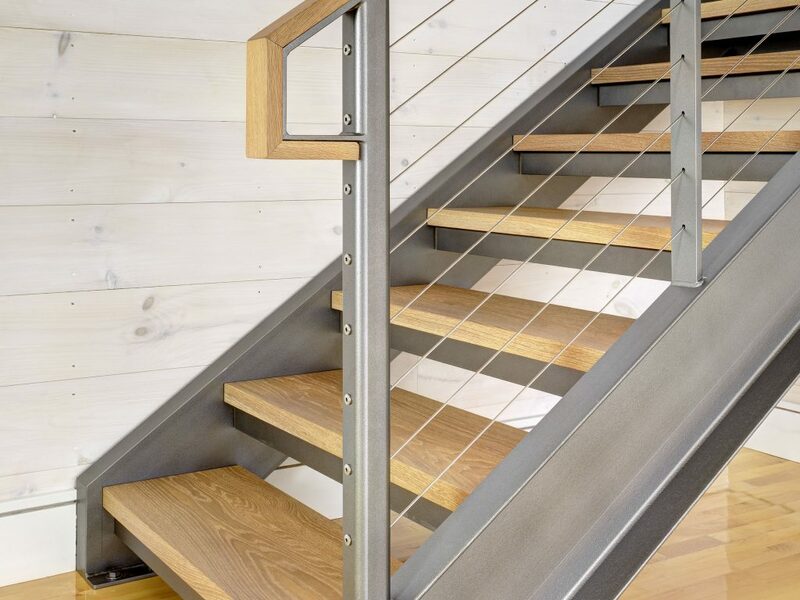 Material and Finish: "Dazzling Pewter" powder-coated steel posts with white oak wood top rail. 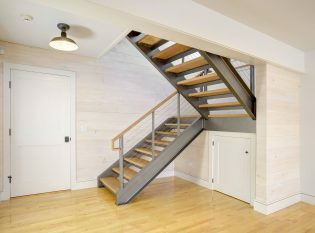 Description: Ithaca Style cable railing and custom floating staircase. 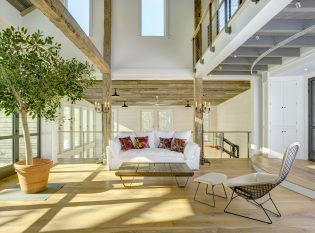 We had the pleasure of working with James Dixon Architects and Geoff Haydock of Whetstone Builders on this unique barn rebuilt for luxury entertainment. 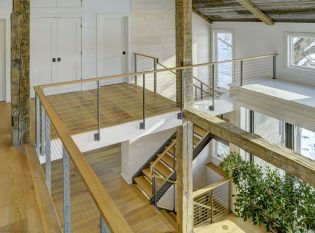 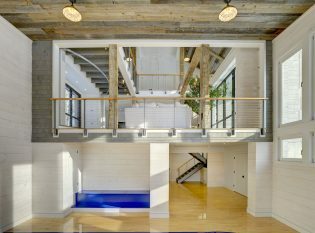 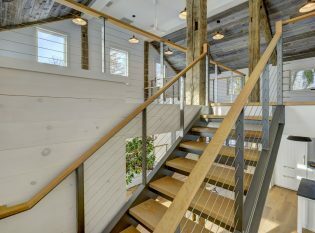 Keuka Studios provided the interior staircases and the extensive cable railing system that runs throughout the structure. 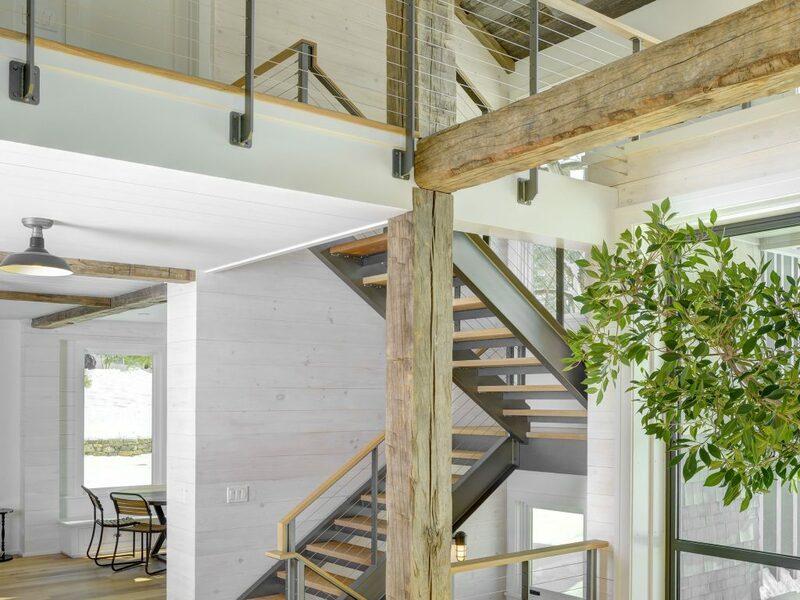 Originally, James Dixon conceived the project as a remodel of an existing barn. 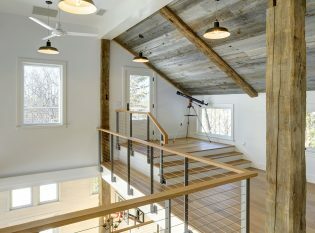 However, it quickly became evident that the barn wasn’t structurally fit for renovation and had to be rebuilt from the ground up. 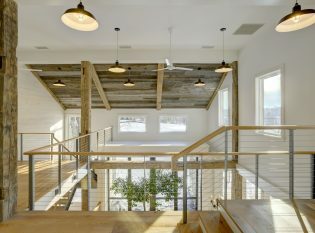 Dixon and the builders made every effort to preserve materials from the old structure and use them in the new design. 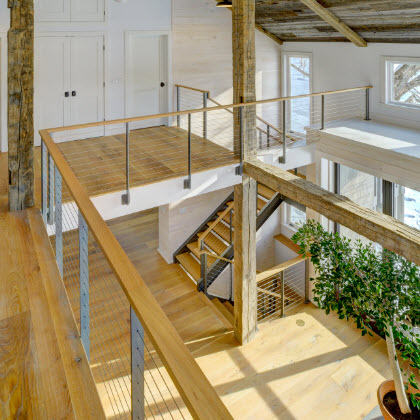 When you enter the barn, you immediately feel the warm glow of the antique pine floors that receive direct sunlight from the building’s large window installations. 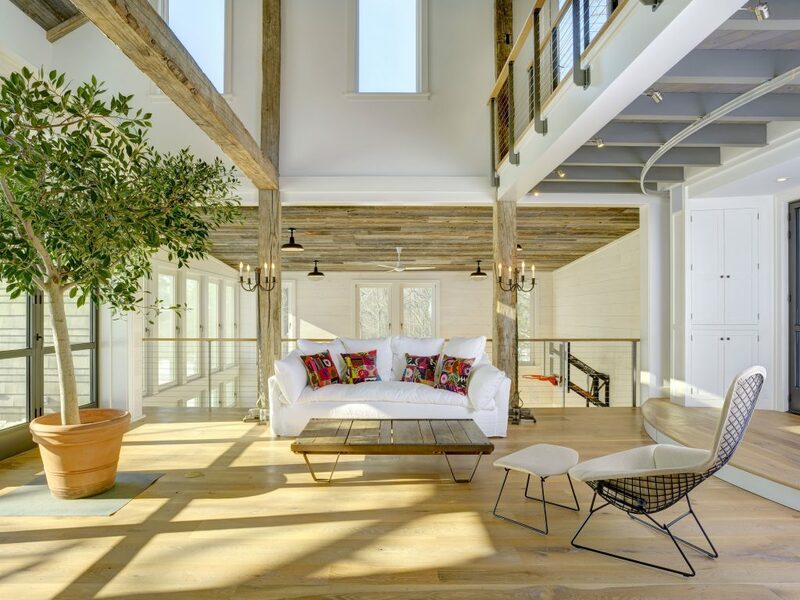 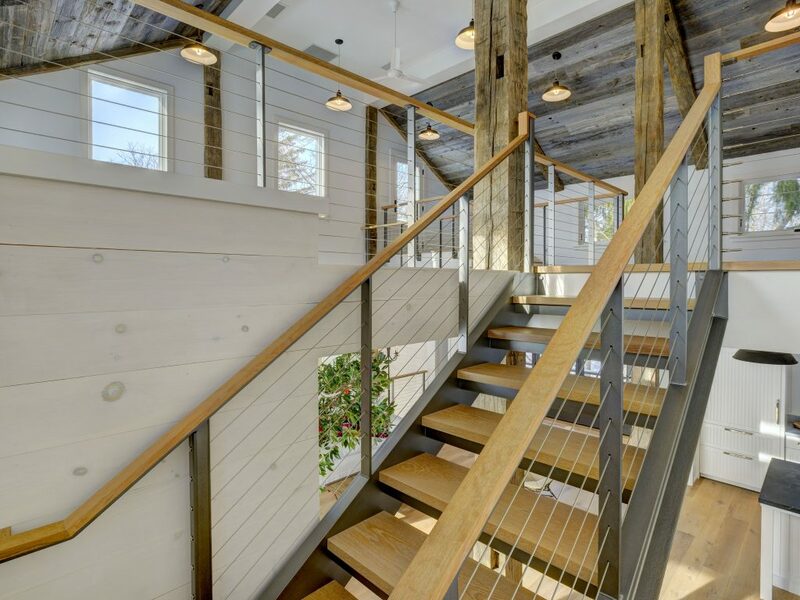 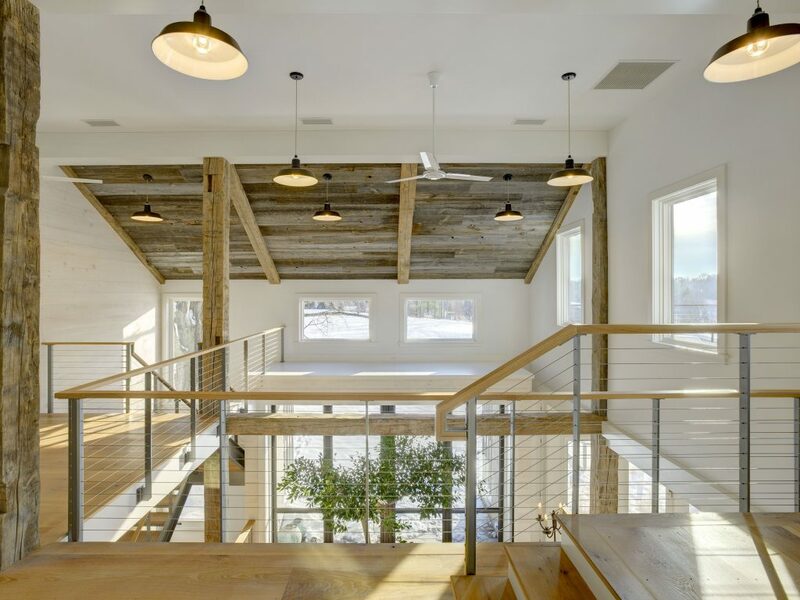 Light also bounces off the barn’s whitewashed paneling giving the space a vibrant feel. 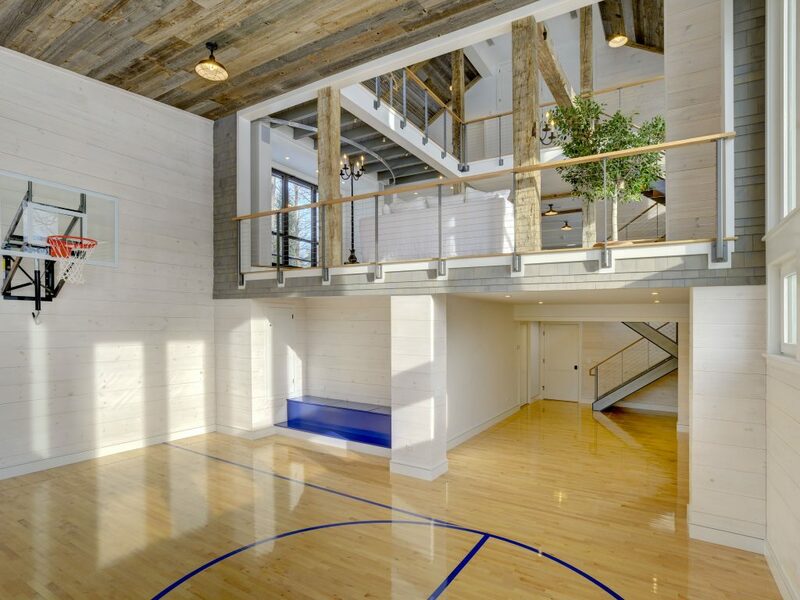 The reclaimed barn board ceiling and exposed timbers give the new barn a worn, rustic appearance Complete with a half-sized basketball court, this “party barn” features a stage for live entertainment, an observation deck for stargazing through a telescope, lounge areas, and bunk rooms. 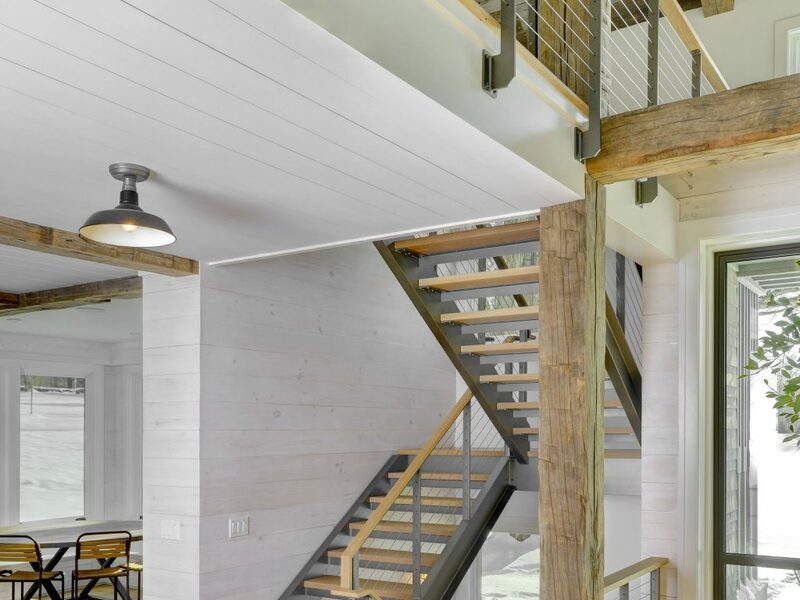 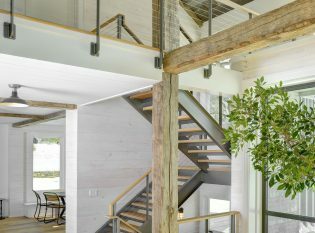 Keuka Studios custom designed and fabricated the interior staircases for the multi-level barn. To match the building’s industrial style, the staircases have welded steel channel stringers and 1.5” thick white oak treads. To adhere with local building codes, we affixed a small steel angle to the underside of the treads. The staircases, interior balconies, exterior porch, and exterior deck all feature our Ithaca Style cable railing. 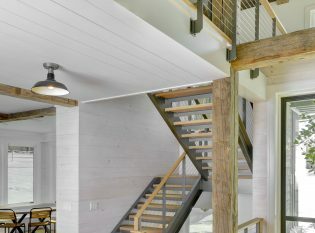 For all the interior applications we used “Dazzling Pewter” powder-coated steel posts and white oak top rails. 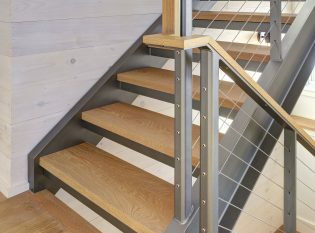 On the exterior applications, we used a “Raven Black” powder coat for the posts and IPE for the handrails.